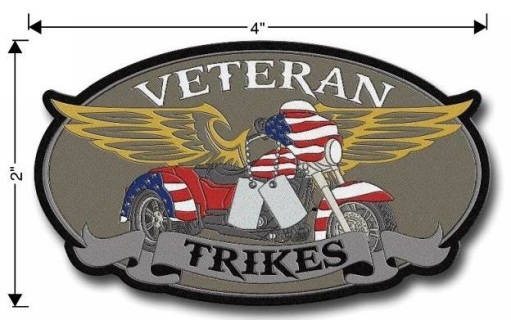 Thank you for visiting Veteran Trikes of Prestonsburg, KY. We are Veteran owned and Operated since 2012. We service all of the United States. Give us the opportunity to serve you for your next trike or trike kit. Thank you for your interest in our logo Vest Patch. It has had amazing feedback and alot of interest. We take pride in our trikes and our logo stands for our pride and is a representation of what we stand for. When you purchase our logo, you are not only representing us, but you are representing AMERICA as we designed this logo with our AMERICAN veterans in mind. Our owner is an Army Veteran and he understands the importance of pride and attention to detail. The size of the patch is approximately 4"x2" and it is available for sewn on or peel and stick applications. 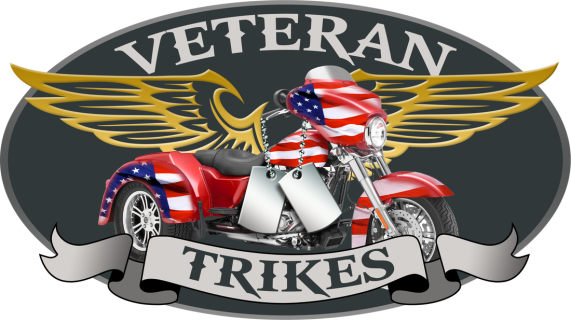 Veteran Trikes is going to make a 10% Sales Donation at the end of each year to the Veteran Organization of your choice below. Prices include shipping and all applicable taxes. Thank you for your interest in our logo sticker. It has had amazing feedback and alot of interest. We take pride in our trikes and our logo stands for our pride and is a representation of what we stand for. The size of the logo is approximately 3"x5" and it is on thick vinyl that will last a long time. We can also have the logo custom sized for you, just let us know what size you want and we can make it. Thank you for your interest in our NEW Vest Pin. It has had amazing feedback and a lot of interest. We take pride in our trikes and our logo stands for our pride and is a representation of what we stand for. 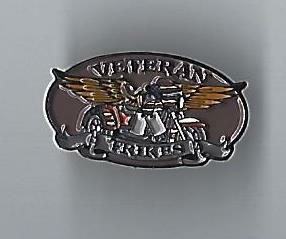 The size of the Pin is a standard 2" x 1.5" Vest Pin and Looks Great on any apparel. 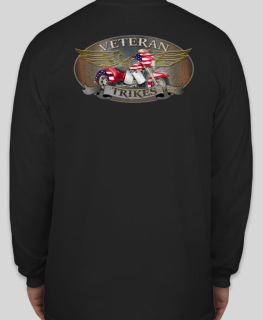 Our Veteran Trikes logo t-shirt is a hot item and is available in BLACK only. You can order Long Sleeve or Short Sleeve and is made from 100% cotton Gildan Tee.